The Cowboys entered Monday’s game knowing that they needed a win to save their season. While their backs were against the wall, they believed in themselves. In the beginning it looked like things were going to go their way, little did they know what they would end up having to deal with. The Dallas defense came out ready to play in this one. On the third play of the game Terrance Newman picked off Eli Manning and returned it 20 yards to the Giants 5 yard-line. Tony Romo and the much criticized offensive line came out and popped the ball into the end zone with a pass to Jason Witten to give the Cowboys a 7-0 lead. The Cowboys had a great opportunity to go up by 14 after Manning threw his second pick in as many drives. S Gerald Sensabaugh was the lucky Cowboy who had the ball tipped off Hakeem Nicks’ hands and land in his. He returned the ball to the Giants 18 where Romo and crew took over. They were able to get inside the Giants 10 yard line but a third down pass went through Austin’s hands at the goalline and the Cowboys had to settle for a Buehler field goal to go up 10-0. The Giants wasted no time answering back as they drove the field, mixing the run and pass very effectively. Hakeem Nicks was the star of the drive making a great third down catch along the sideline and then catching a 7-yard touchdown pass from Manning. Hicks was matched up against S Gerald Sensabaugh, which had to be a mistake by the Cowboys coaching staff. The first quarter came to a close with the Cowboys up 10-7. Amazingly, both teams went the entire first quarter without a penalty. The Cowboys had to be thrilled that they went a quarter of football without seeing a yellow marker on the field. The only player that seemed a little of his game for the Cowboys was Miles Austin who had two drops. The second quarter started with the Giants driving only to give up the ball on their third turnover of the game. RB Brandon Jacobs had the ball stripped and recovered by Bradie James. The Cowboys took the ball in Giants territory and on the second play QB Tony Romo was leveled by LB Michael Boley after he threw a 14-yard completion to Miles Austin. Romo left the game for x-rays on his shoulder and did not return with a fractured left clavicle. The Cowboys had to settle for a 41-yard field goal by David Buehler to go up 13-7. QB Jon Kitna came into the game and was largely ineffective. The Giants were held to a three-and-out which forced them to turn to rookie punter Matt Dodge who unleashed a massive 65-yard punt. Cowboys electrifying rookie Dez Bryant made a nice catch on the punt and proceeded to run it back 88 yards for a touchdown, his second return of the year. The Giants didn’t let that get them down, however. Manning led the Giants down the field on a great drive, highlighted by Jacobs and Bradshaw running behind their all-pro offensive line. Manning then hooked up with Hakeem Nicks for a 8-yard touchdown pass, his second of the game, capping an 80-yard drive. Kitna brought the Cowboys out and continued to stall the Cowboys offense. With Romo out, the Giants just sent pressure knowing they only needed to stop the run because Kitna is not going to beat you. Dallas went three-and-out and was just trying to hang on until halftime. The Giant had other plans as Bradshaw ripped off a 22-yard scamper down to the Cowboys 20 and you could feel the momentum switching to the Giants side. That run setup a Steve Smith touchdown pass from 14-yards out and the Cowboys felt their season slipping away. With the Cowboys trying to save some momentum and looking to rebound on the scoreboard, Kitna hit Witten on a short cross over the middle and Witten fumbled the ball which the Giants recovered and led to a 53-yard Laurence Tynes field goal to extend their lead to 24-21 at halftime. 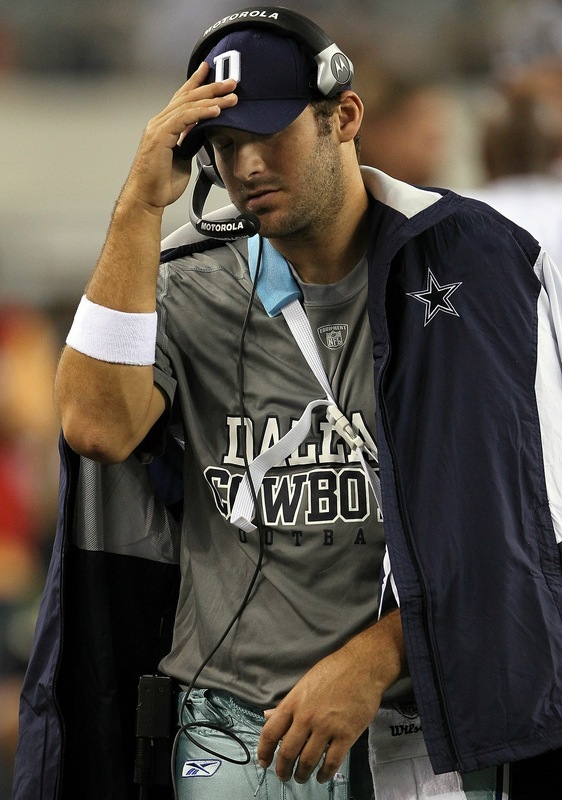 The Cowboys came out of the locker room and looked completely deflated. Kitna led, yet another, three-and-out, and the Cowboys punted to the Giants. Manning wasted no time taking the Giants down the field and hit WR Mario Manningham on a screen pass that ended up going 25 yards into the end zone aided by a crushing block by lineman Chris Snee on Bradie James. The rout was on as the Giants took a 31-20 lead and never looked back. While Kitna and the Cowboys continued to demonstrate a complete lack of heart and integrity, the Giants kept pummeling them with a Brandon Jacobs 30-yard touchdown which turned out to be the winning touchdown. While there was a lot of sloppy play to follow, Dallas mounted a bit of a threat with Kitna at the helm, getting two Dez Bryant touchdown catches (15, 15). With :45 left the Cowboys were down 41-35 going for an onside kick. The Giants were able to recover the kick and put a dagger into the heart of the Cowboys season.